Mommy guilt is just about the worst guilt there is. It lurks,victimizing innocent moms, day-in and day-out–and sometimes through the night. Mommy guilt is very real, and it doesn’t matter if you are at home full time with your little ones, or dropping them off at preschool before your full time career. The universal guilt sneaks in, piles up, and eventually suffocates. There’s currently a lot of buzz about “Mommy Wars,” and writers are offering encouragement to stop the madness of comparing ourselves to other moms. 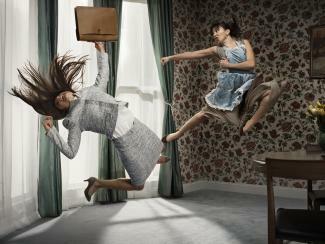 And while I’m certain there’s an aspect of mommy guilt that stems from “Mommy Wars,” I’m more certain that the ultimate battle is raging not among moms, but in moms–the battle is really against ourselves. I see it all day long in my own life. The guilt ranges from how much television I allow my kids to watch to how much fast food we indulge in. I routinely go through a silent monologue, reassuring myself that the cartoons I choose for them are safe and educational, and we choose a fruit cup over fries 50 percent of the time. The case against myself is proven when I conclude it’s for sanity’s sake I allow these things anyway, and a sane mother is a good mother! At no point do images of a better mom feeding her kids organic finger foods while teaching them guitar lessons (on the instrument they made together from recycled materials) factor into the debate with myself. It’s an internal battle that wages, and while outside influences do shape our expectations and standards, I don’t think we are giving credit to the real source of mommy guilt–a mommy’s vulnerable, wavering, insecure heart. Just today I battled thoughts of what things a “good mom” would be doing versus what I was doing. 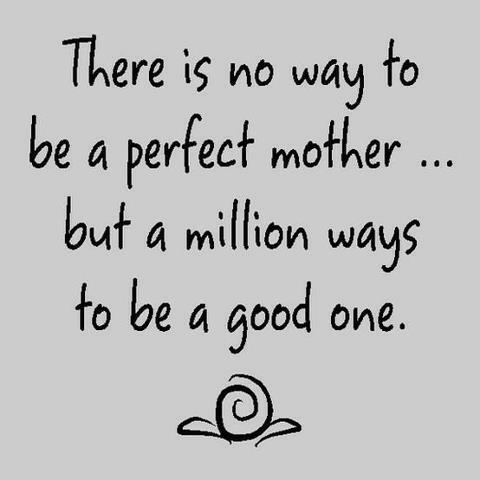 The “good mom” isn’t anyone else, it’s the perfect “me” I think I could be if I’d just put my back into it. It’s the me who wouldn’t be sitting here writing about her feelings, while her son watches Sprout. It’s the me who wouldn’t make a separate dinner for her kids, because her kids eat stuffed bell peppers like good little adults. It’s the me who, instead of bouncing from chore to chore, bounces from toy to toy with her toddler. This is the mom that haunts me, pressures me, and lures me into the dangerous territory of continual guilt over my performance as a mom. I’ve often been told, “Don’t worry, God has equipped you to give your child exactly what he/she needs.” Although true, even that’s of little comfort because the burden still falls on the mother. Something I truly feel God spoke to me this week–while I was going over all the reasons I should be guilty–stopped me in my tracks. Yes, you were tailor-made to be your children’s mommy. But consider this: God also designed them to need exactly what you have to offer. In other words, your children are tailor-made for you. Chances are, your kid was never going to like stuffed peppers anyway, and adores the creative way you turned the dish quickly into burritos just for them. So, let’s stop comparing ourselves to a perfect specimen of a mother and get comfortable in our perfectly imperfect reality. It should ease some of the frustration to remind yourself, not only do you have just what they need, they need just what you have. Nothing more, and certainly nothing less.